lenNY's Yankees - A Bronx Bombers Blog: Beltran afraid to deal with Mets' training staff? Beltran afraid to deal with Mets' training staff? I would be terrified after last year. Mets center fielder Carlos Beltran underwent knee surgery yesterday without permission from the Mets. They were aware of the injury, but were looking to confer with a third doctor before Beltran had the surgery. Beltran already had two of the top surgeons in the country agree that he needed to have the surgery, yet the Mets are mad at him for doing it without telling them. 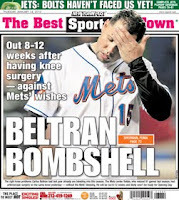 The Mets will be funding the surgery, but they still are looking into taking action against Beltran. Why? I do not know. Beltran's probably thinking, "I don't want to deal with an injury-plagued team's training staff. I'll do things my own way and get back on the field as soon as possible." Meanwhile, the Mets aren't keeping good terms with one of their star players. Let's just say, the Mets aren't in a very good place right now.